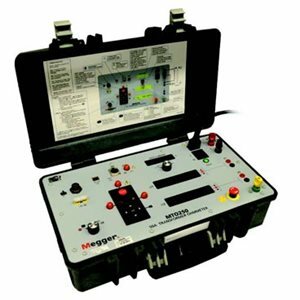 The MTO250 Transformer ohmmeter is a line-operated, field-portable instrument designed specifically to measure the resistance of all types of magnetic windings safely and accurately. It tests transformers, shunt reactors, rotating machine windings and performs low resistance measurements on connections, contacts and control circuits. The dual set of potential inputs enables the resistance measurement of either two primary, two secondary windings, or of a primary plus a secondary winding simultaneously. This dual reading, dual injection characteristic, is a highly efficient method of completing tests in a timely manner.